The Black Madonna is a statue found in several hundred churches, particularly in France and Spain. Many are documented of their appearance coming as early as the eighth century. Where they originated from is for most part uncertain. Most European’s with an interest in these statues agree the Black Madonna is the representation of Mary Magdalene. 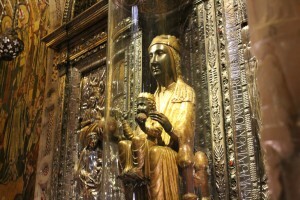 The most famous of the Black Madonna’s is at the monastery of Monserratt, Spain. Hundreds of tourists come to the mountain monastery/city to touch the globe Mary is holding in the grand, ornate cathedral in Monserratt. Monserratt is a most unique place, located 2100 feet high in a beautiful mountain top area, it is one of the most sacred religious spots in southern Europe. The mountaintop is a complex of rounded peaks making it an extraordinary site with a variety of walking trails and monasteries in the mountain domes. There are many places in the elevated area to sit and receive the transmission of higher sources coming from beyond the physical reality of earth. It is as if a person can commune with heavenly energies if they are aware enough to perceive them while in the mountains. There is an amazing trail on the northern side of the mountain and tribute to Mother Mary with a variety of shrines and places to reflect. Slightly lower than the mountain city is a special location, a cave called Santa Cova where it is told, the Black Madonna was discovered somewhere in the eighth century. A church has been built around a small cave to make the location of the Madonna like a church with a shrine inside. When I entered the sanctuary an invisible wave of a strong vibration entered into me resonating strongly in my second chakra area. How come only a small group of people could be interested in such a phenomenon? I have felt something similar to this before when communing with the presence of Marie Magdalene but it was never this powerful. I knew this was a strong source. The image I received was that of the Cathars, who directly followed Marie’s teachings. In this vision there were 12 women around the energy of Mary. Also, on the outside of the circle a second, larger one of a combination of 12 women and men. Beyond our other circles of women and men in groups of 12 were in this vision. These people were not worshiping Mary directly but practicing her teachings, one of love shared sincerely and openly amongst each other. Way back when these people were part of the transformative practices; to receive from Mary Magdalene. It was their responsibility to sustain the teachings by application, it was not something Marie or Jesus bestowed upon them. It was all created in a circle of love amongst each other in a honest way in daily practice. The memories of such intense dedication was felt. All magnified by the strong energetic presence of the mountain made this place even more powerful. A prayer came to me in the church, one I believe describes the teachings of the Magdalene accurately. “Mary Magdalene, divine bondings of love amongst women and men, please be shared with me and the world.” In this vision I saw people following those teachings of loving each other in the highest ways they knew how to love with their hearts open to each other in a non-defensive way. There is in the spirit of cooperation and kindness the Cathars groups of people, one whom were respected for their growing ideals of perfect love. Black Madonnas can be found in churches through out Europe including in the Languedoc Region of South Western France in Limoux and Alet Les Bains.